Our trip on April 4th was really one for the books! 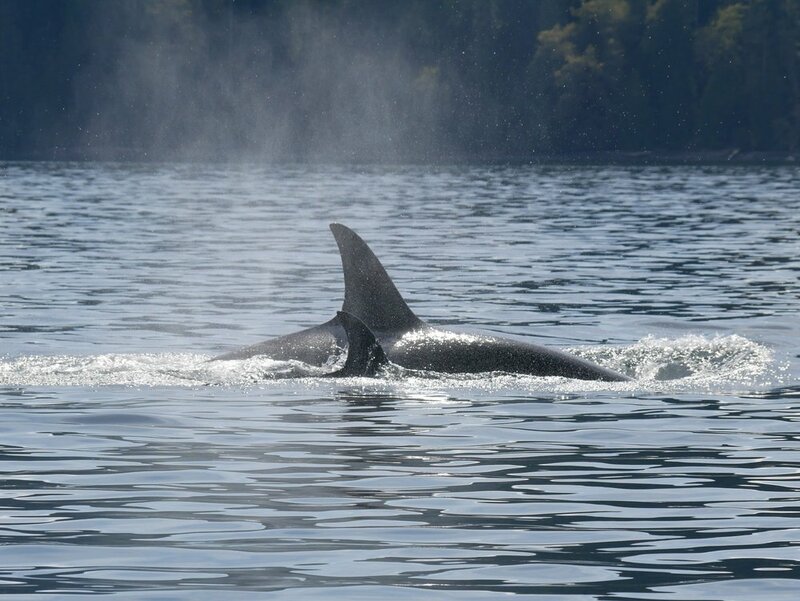 The trip started off with a departure from Nanaimo harbour where we left in search of whales and other wildlife, and we were not disappointed! The trip stayed close to home with the whales being found only half an hour away in Trincomali Channel. T49A3 and T49A4 travelling together in Trinomali Channel. Once on scene we were greeted by the T19s and the T49As who were putting on quite a show. There was a lot of tail slapping, rapid surfacing, and also a little family drama. One of the T49A adults actually rammed the younger one out of the water! Check out our home page for a video of the encounter. Sights like this are not unheard of, and family members would never do something to intentionally hurt a member of their pod. More likely this was a little bit of discipline for the young whale to teach them an important life lesson. Perhaps in this case the calf got too far away from the pod or misbehaved in some way we couldn’t see but for now that will remain a mystery. T19B, a large male with a significant left lean to his dorsal fin. After the excitement of the orcas the trip started the journey back home, seeing a ton of wildlife including Vultures, Eagles, Harbour Seals, and the huge Sea Lions that call the Gulf Islands home, including this big California Sea lion basking in the sun. Enjoy some more photos of the day taken by our naturalist Rodrigo Menezes. Action just beneath the surface! A couple of Orca Waterfalls. If you are interested in booking a trip with us give us a call at 1-250-667-5177 or book online through our website.